On the Parish? is a study of the negotiations which took place over the allocation of poor relief in the rural communities of sixteenth, seventeenth and early eighteenth century England. 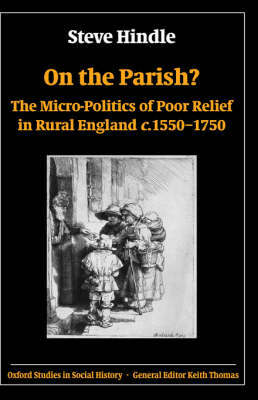 It analyses the relationships between the enduring systems of informal support through which the labouring poor made attempts to survive for themselves; the expanding range of endowed charity encouraged by the late sixteenth century statutes for charitable uses; and the developing system of parish relief co-ordinated under the Elizabethan poor laws. Based on exhaustive research in the archives of the trustees who administered endowments, of the overseers of the poor who assessed rates and distributed pensions, of the magistrates who audited and co-ordinated relief and of the royal judges who played such an important role in interpreting the Elizabethan statutes, the book reconstructs the hierarchy of provision of relief as it was experienced among the poor themselves. It argues that receipt of a parish pension was only the final (and by no means the inevitable) stage in a protracted process of negotiation between prospective pensioners (or 'collectioners', as they came to be called) and parish officers. This running theme is itself reflected in a series of chapters whose sequence seeks to mirror the experience of indigence, moving gradually (and by stages) from the networks of care provided by kin and neighbours into the bureaucracy of the parish relief system, emphasising in particular the importance of labour discipline in the thinking of parish officers. By illuminating the workings of a relief system in which notions of entitlement were both under-developed and contested, On the Parish? provides historical perspective for contemporary debates about the rights and obligations of the poor in a society where the dismantling of the welfare state implies that there is, once again, no right to relief from cradle to grave.